Whether you’re reading this on the day it’s published or on some far away date in the future: Welcome! I’m both excited and relieved to be opening the doors to my new online home today. It’s been a long time coming and I’m tremendously grateful that you’re here. Looking back, I’m glad it took me awhile to get to this point. It gave me time to learn more about how to create a compelling website. It also gave me the freedom to roam a bit, until I serendipitously found my way to an amazingly talented designer at just the right time (thank you Kat Love and Empathysites). When I first began considering a new site, I was a little lost. I wasn’t quite sure where I was going. It turns out I had some significant life transitions to get through first. A big one was selling my home of 21 years and relocating to Sonoma County. Not only did my husband and I move all our stuff to Santa Rosa, but I eventually moved my therapy and coaching business too. In many ways this entire experience has felt like starting over, even though I was in private practice for 15 years before making the move. Now that life is returning to its natural rhythm, though, I’m thrilled to be establishing myself as a women’s counselor, life coach and therapist serving Santa Rosa, the San Francisco Bay Area and beyond. Lately I’ve been thinking about how I’m also making a fresh start with blogging. I wrote a blog for six years, then took a hiatus in January 2015 (to make space for all those transitions I mentioned). It occurred to me the other day that things have changed. The online world I stepped away from two years ago doesn’t exactly exist anymore. I mean, you can’t go very far on the web these days without stumbling across clickbait and propaganda. Not to mention hotbeds of hate and anger on Twitter and FaceBook. Yes, all this was there two years ago, but not in such frightening and distressing ways. I see how deeply upsetting it is to my clients. And it’s made me deeply consider what I want to create in my new online space, and what my commitment is to you. 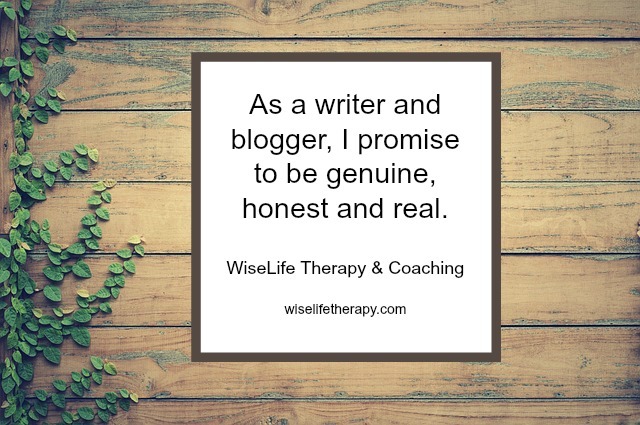 If you’ve seen my home page or my about page, you’ve got a pretty good idea of what I do and who I am as a counselor, life coach and therapist. So now I want to take a moment to make a promise to you about who I am as a writer and blogger. Create a welcoming environment that’s inclusive and diverse. I want you to feel safe, cared for and cared about when you’re here. Be genuine, honest and real. I won’t make stuff up and I’ll always cite my sources if I know them. Steer clear of questionable marketing tactics. The web is loaded with tips on how to get you to come here and stay here. Not all of it’s bad, but a lot of it’s questionable. Find a balance between too much sharing and not enough. I’m going for a middle ground between the personal growth trend of over-sharing and the tendency that we therapists sometimes have to remove ourselves from our writing. Focus more on stories than advice. Stories guide you to your own inspiration and allow you to take what you need. Advice, on the other hand, can shut you down. Write meaningful and thoughtful content that you’ll find insightful or helpful in some way. Design an online space for women that reflects my deeply held values: belonging, creativity, love and wisdom. I’m so looking forward to taking this journey with you. Thank you for being here and thank you for being you. And if you ever want to get in touch, I’m just a phone call or email away.